While the fall holidays may be over, fortunately the pomegranates aren’t. You can still find them in abundance, and prices are dropping to incredible lows — four shekels a kilo. We have a whole heap of discount pomegranates in the kitchen. And they’re lovely. 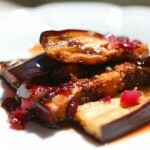 I was hoping to come up with some creative pomegranate recipe for the holiday, but we couldn’t seem to keep ourselves from eating the fruit before I got to cook with them. But actually, that’s fine with me — pomegranate seeds are a trendy condiment tossed over all sorts of dishes, such as roasted eggplant; mixed into tabbouleh; and as an addition to salads. All decent combinations, but none beat the unadulterated punch of just biting straight into a row of juicy seeds, straight from the fruit. 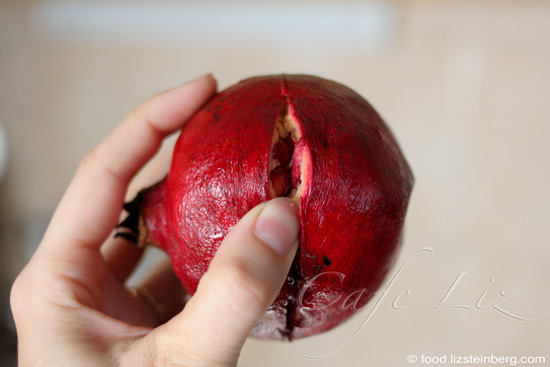 There are probably a million techniques for breaking open the pomegranate itself, in order to get at those seeds. When I lived in Haifa, the popular method involved throwing the pomegranate at the ground, a not-so-gentle reminder that rimon, the pomegranate’s Hebrew name, also means grenade. The pomegranate would split open from the force of the impact, splattering red juice everywhere. 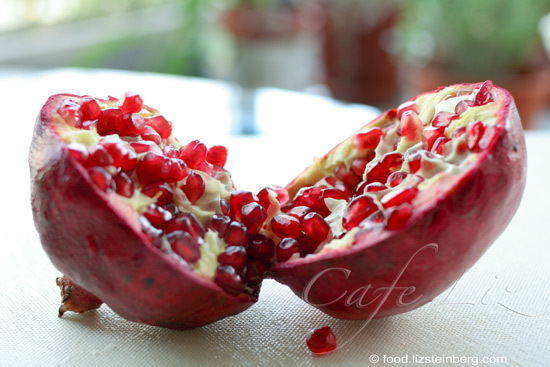 In a slight nod to hygiene — or the kitchen floor — we would often tie the pomegranate inside a plastic bag first. Now, while this is a surefire way to amuse college students, I’ve come to believe that it’s not the most effective way to open a pomegranate. After all, the bloody mess is a sign that you’re losing valuable seeds. At this point, my goal is to break as few of them as possible — both to minimize the mess and to have more seeds to eat. 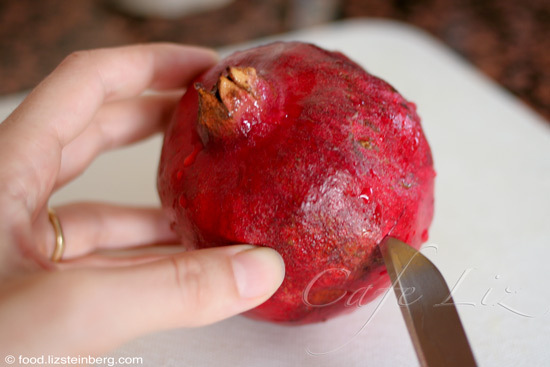 So here’s our trick: Instead of just slicing the pomegranate in half, my husband scores a ring around it, cutting no deeper than the outer layer of skin. At that point, the only thing holding the pomegranate together is the bitter pith between the seeds. 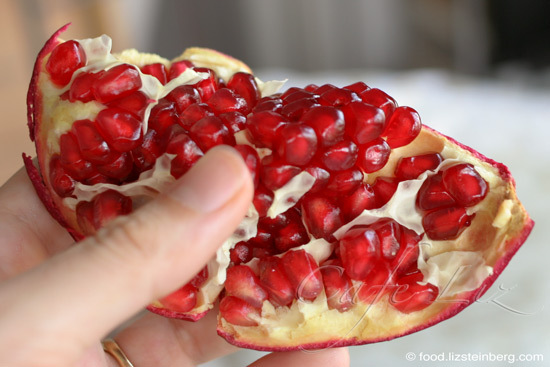 If you pry your fingers between the split skin, you can pull the pomegranate apart, no broken seeds, no mess. A few seeds will pop out in the process, so beware. That’s about as deep as you have to cut. Actually, you don’t even have to slice right across the middle, like most people do automatically. You could slice it at an angle, too, and this gives you the advantage of quicker, easier access to the seeds (cutting across the middle lets you see the form of the star-shaped pith, which is less conducive to easy seeding). Then you can break the two halves down into smaller sections, simply by pulling them apart. More seeds will pop out. Look at the cutting board. Notice that it is white. Have you ever seen so little collateral damage? At this point, my husband picks the seeds out of the pith, in order to eat from a bowl with a spoon. 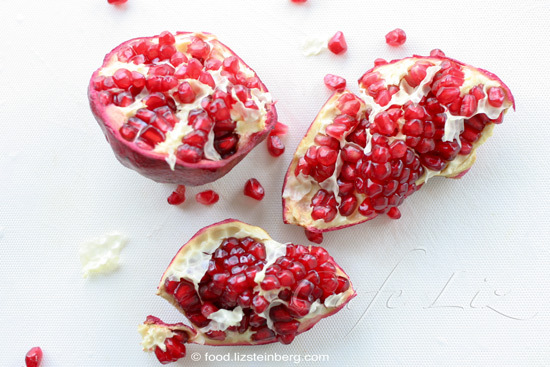 But I prefer to eat them straight out of the pomegranate — I peel back the membrane to expose glistening rows of seeds, and bite in. Why? Because biting into the densely aligned seeds gives you a better mouthfeel than eating them by the spoonful — something more reminiscent of your average fruit. Just make sure you avoid the pith. I mean, doesn’t that cluster of seeds look tempting? If I can keep enough fruit around for it, I’ll be making this recipe for pomegranate syrup: Basically, a liter of juice boiled with a cup of sugar until it reduces to 400 grams. Conveniently, my current bottle just ran out. 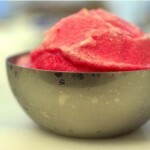 And since it’s the season, here’s Sarah’s ode to pomegranates, with a sorbet recipe. 9 Responses to "How to break open a pomegranate"
Regarding your comarison of the pomegranate to a hand grenade – pomegranate is french for grenade fruit…. i will definitely try this technique out. i always give the pomenegrante a few good smacks on the kitchen counter before cutting open. medical schools should require students to de-seed a pomegrante seed with no loss of juice/blood before they’re allowed to perform surgery. That’s basically the method I use, although I get lazy sometimes and cut right across. I think the grenade method is great if you want to extract the juice. 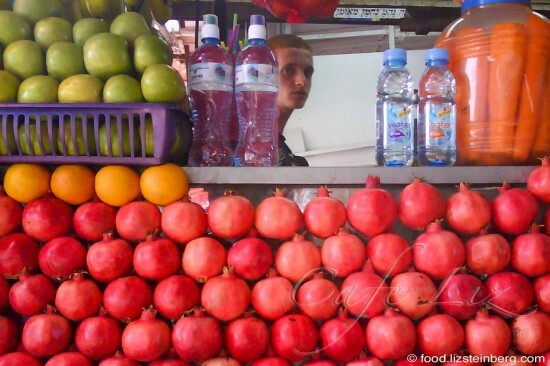 Pretty picture of the pomegranate juice stand. Thanks, Cara! Good luck, I hope it works for you. I can’t open a pomegranate any other way now. If you want to cut it presentable: you have to slice the top(where the flower was)with a little skin about 5cm diameter off, carve the white part out. Then cut just through the skin ALONG BUMPS from top to bottom, but not going all the way to the center. Gently pull away top of each section, not ripping it off the bottom. After removing the white membranes that cover the seeds. It looks like a flower. Bottom part creates the center of the flower and each section a petal. I found it very convenient using rubber gloves for removing the seeds out, you have a better grip. And to avoid staining, do it in bowl of water, juice splashes stay under water.